24/7 Emergency Response: Call us now! "Your company, from the office to the workmen was the best service business we’ve run into in a long time. The only problem using us for a reference is the prospective customer will think we’re being paid!" A Pipe Breaks in Your Home…Who Do You Call? When a pipe breaks It not only floods your home but if you live in a condominium or townhouse, it could do damage to the unit next door and the unit below. Now you have a real mess on your hands. Immediately shut the main water supply off & call a restoration professional. For the better restoration companies, applied structural drying techniques are utilized; they are the preferred way to mitigate the damage. Reputable restoration company technicians have professional certifications through IICRC, which stands for the Institute of Inspection, Cleaning and Restoration Certification. This is an extensive training program that provides them with special skills & knowledge to handle any restoration emergency. IICRC technicians are trained in the use of psychometrics which is the scientific standard for monitoring the moisture levels of the air & structure in a water damaged structure. These standards help them evaluate the drying process & how much equipment to use. Restoration technicians document moisture readings to show that the structure has been dried properly. The final documentation is a psychometric drying log which is how the technician tracks the progression of the dry out. The industry standard has changed recently from drying out a home in an uncontrolled environment to focusing on significantly controlling the environment with state-of-the-art moisture detection meters, thermo- hygrometers, specialized commercial grade dehumidifiers & high velocity air movers. Knowing how to properly manipulate the indoor environment will facilitate a faster dry-out which will minimize or eliminate any potential health risk associated with mold infestation. EXTRACTION: Extracting water quickly & thorough is the key to drying an area properly. AIR MOVEMENT / EVAPORATION: Air movement will turn water into vapor and is used in conjunction with humidity and temperature control. DEHUMIDIFICATION: Humidity is measured in grains per pound of air. 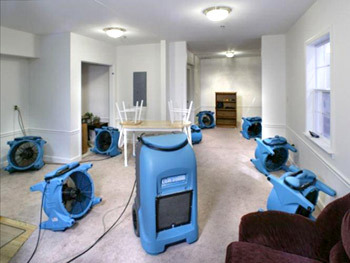 Various dehumidification tools may be used depending on the conditions. TEMPERATURE CONTROL: Managing the temperature ensures the complete drying of wet building materials and allows dehumidifiers to work efficiently. MOISTURE MONITORING: Utilizing moisture meters and thermo- hygrometers as well as proper daily documentation of moisture levels. These 5 keys will ensure that your water damaged structure will be dried down in a timely, professional manner. This will provide you & your family with peace of mind that your home is being returned to a safe & healthy environment. © 2011 Homecrafters Rebuilding, Inc. Send us your details for our records to help with processing your insurance claim. As advocates for our clients, we work to make sure your claim is filed properly and on-time.